For more information for the Bruce Conner: Out of Body exhibition. The Mabuhay Gardens Concert will take place after the inauguration of CROSSROADS (1967) in Las Casas Filipinas de Acuzar. 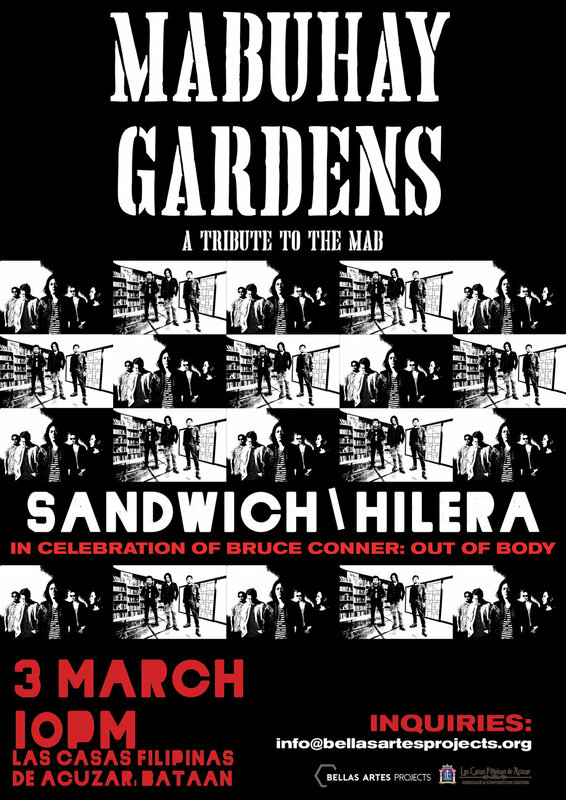 The concert will feature headliners Sandwich and Hilera at Casa Binan at 10pm. 1. The tour will take about 1.5 hours, includes briefings and tour inside the plant building. 2. Please wear comfortable clothes and shoes. No heels and skirts for ladies. Situated on a hilltop reachable by a 20-minute drive from Las Casas and a 45-minute hike on Sunday afternoon. Located on a picturesque spot with a panoramic view of the landscape and facing where the sun sets, Chapel offers a contemplative space to take in Bataan’s natural vista. Video artists Hassan Khan, Lucy Raven and Paul Pfeiffer discuss the influence of Bruce Conner films on their own filmmaking practice.